The St. Leonard remembered by the hill now named after him in Windsor Forest is said, around Clewer, not to have been named after the well known 6th century Frankish hermit, but a local holy man. Like his namesake, he was a recluse and resided in a cell which he had built for himself on the hill. The first record of this hermitage to survive dates from 1215. It continued in use until the dissolution, after which only the field name Eremytescroft or “Hermit’s Croft” remained. The hermitage stood on the site of what is now the big house on the Legoland estate, still called St. Leonard's. The associated Holy Well was the spring that feeds the pond there. This was the site of the lost Domesday village (1086) of Losfield (possibly “Leo(nard)’s Field”). The chapel was mentioned by Malory in connection with King Arthur and his Knights of the Round Table. He claimed St. Leonard’s successor to have been one Sir Brastias. He was originally a knight of Duke Gorlois of Tintagel (Cornwall), the man whose wife, Igraine, King Uther had fallen in love with. Merlin magically turned Uther into the image of Gorlois and his bodyguard, Sir Ulfius, into Sir Brastias, so they could steel into Gorlois’ castle. Uther was there able to seduce Igraine and thus Arthur, their son, was born. Sir Brastias served Uther, after Gorlois’ death, but later retired to the Clewer hermitage. Many years later, Sir Lancelot took to hiding out here during his turbulent affair with Queen Guinevere. He once visited, with Sir Lavaine, while training for a tournament. It was not a happy time however. Lancelot fell asleep by St. Leonard’s well, just as a lady and her hunting party arrived chasing a hind. She immediately shot the poor knight in the buttocks and rode off! The hermit spent many days nursing Lancelot back to health. Although the famous lamp dug up on the site and used by the Society of Antiquaries as their symbol is now thought to have belonged to the medieval hermit rather than previous Roman inhabitants, the true origins of the chapel may still lie in this latter period, for other Roman remains have been found on the hill. Dedications to St. Leonard are often found in wooded areas and some historians think they indicate where ancient pagan sites connected with the Celtic god Cernnunos have been converted for Christian worship. Cernunnos was a powerful pre-Roman god of the countryside, something like Pan. Various depictions of him, wearing large antlers, have been found throughout Britain and France. 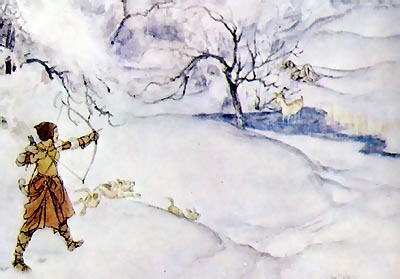 He may be connected with Malory’s lady huntress, but his association with Windsor Forest is better attested by his appearance in the guise of the ghost of Herne the Hunter. Herne was supposedly a huntsman of Richard II. He was mauled by a stag while saving the King’s life and healed by a local wizard who placed the deer’s antlers on his wounded head. Thence the King’s favourite, he was framed as a poacher by jealous colleagues and ran through the Forest in a mad antlered frenzy. He hanged himself on Herne’s Oak: a sacred tree in the Home Park. It was at Clewer Green, that the widowed King Henry VII met Philip the Handsome, King of Castile and Duke of Burgundy in January 1506. The latter had been summoned to the Royal Court at Windsor Castle after he and his wife had been shipwrecked on the Dorset Coast whilst on their way from Spain to the Netherlands. Philip was somewhat anxious about the meeting, being uncertain of King Henry's motives. In the event, everything was very amiable. Philip was made a Knight of the Garter, but he did sign a number of English-biased treaties in return. In later years, the area became the site of a Royal Hunting Lodge, but, by 1756, this became a private estate and the country retreat of William Pitt, who later became the Earl of Chatham. In the 1770s, the house was purchased by the widowed Countess Waldegrave, daughter of Edward Walpole of Frogmore House. She called it Forest Lodge until she was able to get her secret marriage to George III's brother, the Duke of Gloucester, accepted by Parliament, when it became Gloucester Lodge. The magnificent estate became known as St. Leonard's Hill under the 3rd Earl Harcourt and a new and extraordinary gothic style mansion was built by Lord de Barry in 1872. Unloved by later generations, it was partly pulled down in 1926 and the remains fell into ruin.